The court battle between Samsung and Apple has long been considered a proxy fight for a larger war between the iPhone maker and Google. Now, we have concrete evidence the Android purveyor is playing a key role behind the scenes. Emails between Google and Samsung were dissected and authenticated in court today, revealing Google agreed to help the firm behind the Galaxy S5 defend itself against patent infringement claims related to its technology. The 2012 emails show Google was prepared to "defend and indemnify" Samsung in the use of its tech (specifically two universal search patents), of which Apple claims rips off its own IP. As it stands, only one of the patents Google agreed to help defend is still on the table in this trial. Google is prepared not only to pay for some of the defense cots, but it would also help cover any damages Samsung is ordered to pay Apple, according to the emails. The agreement to contribute and compensate for defense and damages stems from a "Mobile Application Distribution Agreement" between Samsung and Google. 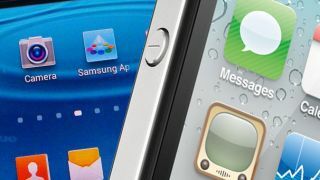 Samsung agreed to stick Google apps on its Galaxy devices, and in return Google signed on to help Samsung in cases, such as this one, where the legality of the use of its technology is called into question. Google patent attorney James Maccoun provided a taped deposition regarding the emails and agreement, and he outlined the set-up between Google and Samsung as one where Google would supply apps as well as backup in case a legal issue arose. It's not apparent how much if any help Samsung has received or will receive from Google. Apple is seeking $2 billion (about £1b, AU$2.1b) in damages from Samsung this time around, while Samsung has countered Cupertino owes it $6.2 million (about £3.6m, AU$6.6m) for infringement on its own patents. Unlike the 2012 trial between the two hardware behemoths, this trial tackles more recent devices, including the iPhone 5 and Galaxy S3. More than a fight for the moral high ground, the court proceedings are about seeing which company will dominant the mobile landscape in the years to come. If one can keep key features from making it to the other's future phones as well as cease sales of old and current devices, then it's one less fight that has to play out in the market. That is, if the appeals ever end.